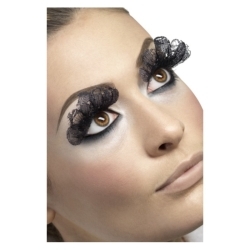 These black lace eyelashes are a great way to add a unique touch to your costume. They are the perfect finishing touch to flapper costumes, showgirl costumes, and punk costumes. The black lace false eyelashes are colored as pictured. Eyelashes includes adhesive and may be trimmed and shaped to give you the desired look.